Description: A contemporary Middle Eastern meets European vibe, Layla recently opened a restaurant in Wimbledon following its original location in Esher, Surrey. The Wimbledon venue combines a bar area with comfortable lounge seating with a restaurant which has intimate alcoves and space for larger groups. Reason for visit: I was asked to visit the restaurant and offered a complimentary meal for two in return for writing a review. I was not asked to write a positive review and I have given my honest opinion. 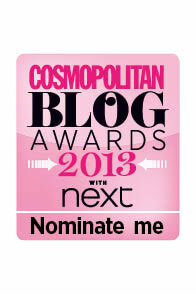 I ate: I shared the mixed mezze selection as a starter. For £8.45 you get falafel, warm pitta bread, houmous, cheese bourak- filo pastry filled with cheese- and kibbeh, which is a mixture of finely ground beef with bulgur wheat. 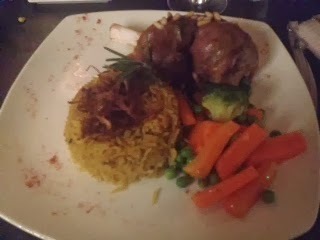 For the main course I chose the house speciality lamb dish, the Layla lamb shank, a braised lamb shank served with oriental rice with a cinnamon sauce and garnished with nuts, £19.95. 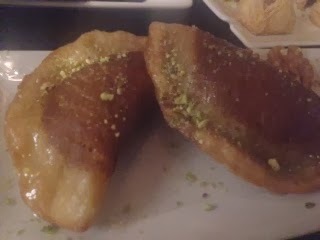 For dessert I decided to try something I had never had before, the karabeej halabi, small pastries filled with pistachio and served with cream, £5.50. 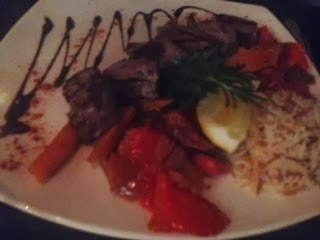 My companion ate: as well as our shared starter, she ordered the lamb meshwi, described on the menu as 'tender lamb fillet pieces chargrilled on a bed of roast vegetables, served with mint yogurt sauce, salsa and vermicelli rice', £19.95. For dessert she ordered one of my favourites, baklava (£6.05) which we shared. 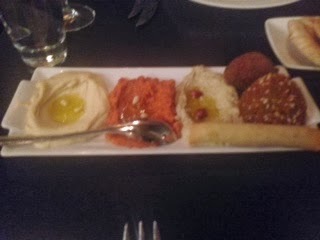 The food was: the pitta breads that came with the starter were wonderfully fluffy and the houmous that went with it was particularly good. My lamb fell of the bone and was beautifully cooked, and the oriental rice had a slightly tangy flavour that went well with the lamb. 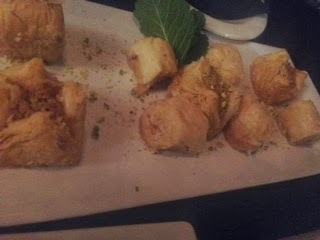 I wasn't such a big fan of the karabeej halabi, which were deep fried as they seemed a little greasy, but the baklava was as good as I have tasted almost anywhere. The service was: I think there may have been a misunderstanding with the starter, as we thought we had ordered the hot and cold mezze platter, which is £8.95 per person, so we were surprised at the quantity of what we got, until I saw the bill at the end and realised it listed one portion of the mixed mezze platter, though to be honest I don't know if the misunderstanding was my fault or the waiter's so I won't hold that against them. They were quite busy and it would have been nice to have more waiting staff on the floor, but the service was friendly and the waitress knew her stuff when we asked a couple of questions about the food. Price range/value for money: our main courses were at the most expensive end of the scale but there are plenty of dishes around the £15 mark, but I fact most main courses seem to be around £16-£20 - that may be a reflection of the Wimbledon village location but also the quality of the food. The baklava may sound expensive at just over £6 but the dessert was plenty big enough for two to share. The house white wine was very reasonably priced, and delicious. Would I recommend it? Absolutely, the food was excellent and service was good, and I like the fact that the restaurant can cater to large groups but there are still plenty of alcove tables where you feel like you can have a quieter or more intimate meal. I liked the look of a lot of the fish dishes on their menu too so if I come back, I would definitely try that! Thanks to Layla restaurant for the complimentary meal for two. food looks and sounds good. Thanks for your comment - I wasn't paid anything to write a review and wasn't asked to make positive comments, though as I said I didn't have to pay for the meal. I thought my review was actually quite balanced - the food was excellent but the service wasn't great, and the restaurant was quite busy when I was there. Obviously you've had a different experience though!